Bahian cuisine has been strongly influenced by its rich African history. The cuisine that developed in the region is also popularly known as “oil food” based on the heavy use of dendê (palm) oil, which is extracted from the pulp of the fruit of the palm tree. Different types of hot peppers are another frequent ingredient in Bahia cookery, especially the Capsicum pepper and sauces made with red peppers. 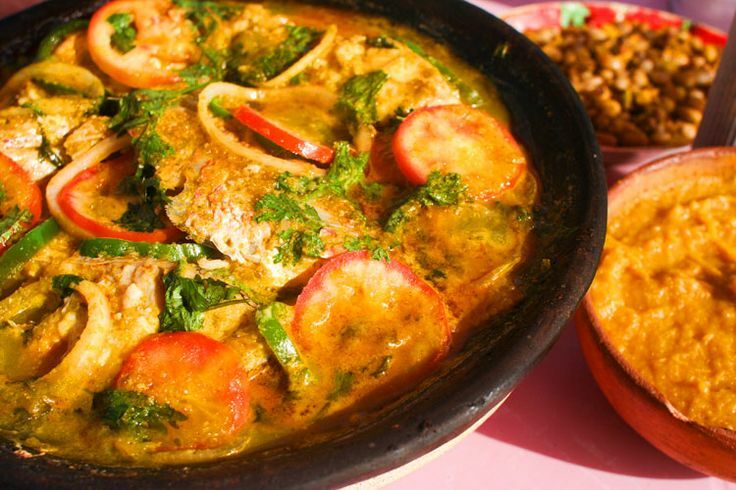 Some of the Bahian cuisine of African origin include delicacies such as bobó de camarão (shrimp), calf’s foot, carurus (made with okra, fish, shrimp, chicken, peanuts, cashew nuts, and seasoned with oil and peppers), vatapá (shrimp, fish or chicken with a flour base, seasoned with coconut milk and palm oil), moqueca (a seafood stew made with coconut milk, shown above), mingaus (porridge), pamonha (cake made of green corn, cinnamon, etc., rolled and cooked in cornhusks), canjica (corn mush), acaçá (corn meal and rice flour mush cooked in a banana leaf), acarajé (dish made with black-eye peas seasoned with salt and onion and fried in palm oil, then served with pepper sauce, dried shrimp, vatapá, tomatoes, and green pepper), ubobó (dish made from beans, bananas, manioc, and seasoned with palm oil), coconut rice, coconut beans, angu (mush made of corn meal), and aloá which is a lemonade drink mixed with honey and other ingredients.